I’ve often dreamed of visiting the Nordic region. I want to see the fjords of Norway as well as the northern lights in Finland. My girls’ paternal grandfather was born in Finland so I think it would be neat to bring them there to learn about their heritage. This Fall, OPI is launching a brand new collection called Nordic Collection by OPI. All 12 shades were inspired by the Nordic region from the landscape and food to music and art. Expect to find a diverse range of colours like spicy browns, rich purples and creamy shades of sea green, pink and coral. Suzi Weiss-Fischmann, OPI Co-founder & Executive VP, went to the region and immersed herself in the culture. All these shades were inspired by her experience. Going My Way or Norway? : No two ways about it…this caramel is delicious! Ice-Bergers & Fries: “Wood” you like a chocolate shake with that? OPI with a Nice Finn-ish: This light, mellowed bronze completes me. The end. My Voice is a Little Norse: This prismatic super-shimmer is worth shouting about. Can’t aFjörd Not To: Whatever it takes, get your hands on this extravagantly creamy coral! How Great is Your Dane? : Pass up this cinnamon coffee? You’re barking up the wrong tree! My Dogsled is a Hybrid: Enliven your environment by wearing this creamy sea green. Suzi Has a Swede Tooth: That’s why I always have this strawberry candy pink on hand! Do You Have this Color in Stock-holm? : Stock up! This icy blue-violet is in hot demand! Thank Glogg it’s Friday! : The start of the weekend is nothing to “wine” about! Viking in a Vinter Vonderland: You can conquer anything in this powerful, deep purple. Skating on Thin Ice-Land: Watch out! This black cherry is dangerously close to gorgeous! I had a hard time picking a favourite from this collection. I loved the browns and the hot pink, but in the end, I went with the sea-green hsade called My Dogsled is a Hybrid. It reminds me of the colour of the water of a glacier lake! 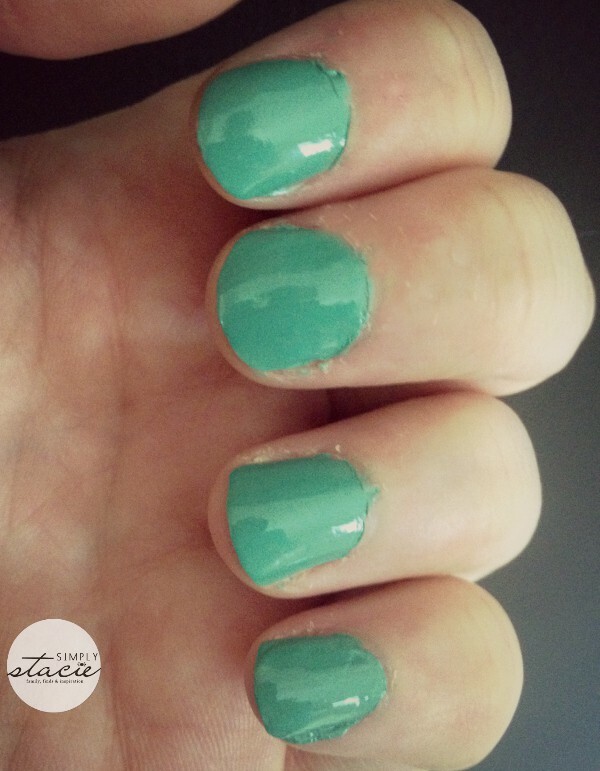 I’ve been wearing my sea-green t-shirts to match my outfit to my nails. I know I’m going the extra mile – ha! My 16 year old daughter has been wearing the icy blue-violet, Do You Have this Color in Stock-holm? It’s a deep, dark purple colour and suits her personal style. Each nail lacquer in the collection has OPI’s exclusive ProWide Brush for easy application. The collection will be available in both nail lacquer and GelColor (for professional salons only). The nail lacquers have an SRP of $11.50 each and will be available starting on August 6th. You can pick them up at professional spas and salons across the country. Enter my giveaway to win the Nordic Collection by OPI! Which colour do you like the best? I love OPI they for sure have the best colors and quality of nail polish. The only thing I would change is the price . Oh I love this new collection, but I love every collection. Their nail polish is extremely durable and the array of shades is endless .. I love this collection (as I do all OPI collections) The colours are gorgeous! Another great collection from OPI, they have the best nail polish! I love OPI nail polish it’s the only brand I will buy!!! This collection is just beautiful! I always enjoy your reviews of the OPI nail polishes. The colors are so beautiful and the names are very creative. They get me smiling. I can see myself wearing the colors and these tag lines going through my head. Plus, these will be great for fall and winter. I love them all-I can’t pick a favorite! They are all so pretty! This is a nice collection, my favorite is My Voice is a Little Norse, I like shimmer and glitter. Thank you for sharing this review. Very pretty shades, another winning collection! Omg I LOVE it!! I LOVE the mint shade!! Gorgeous! I am absolutely loving the My Dogsled is a Hybrid, it’s got a calming feel to it. I love OPI and this collection is pretty especially Suzi Has a Swede Tooth! I will admit I am a nail bitter nasty habit I have stopped, then start again. so never wear polish. But in the summer will put on my toes.